Amberly over at Moments Amid Messes(http://momentsamidmesses.blogspot.com/2007/04/purse-meme.html ) has a an entry about her purse. I thought I would play along and post a photo (or two since I can't figure out how to delete a photo...) of my purse. When I first moved to Fort Wayne, Indiana (home of the seminary dh attended and home of the Vera Bradley purses) I could not figure out what all the hub-bub was over the purses. They are washable, that is about all I could see. Well, the longer I lived there and the more of these purses and totes and accessories I saw the more I began to think they were cute. Last year I no longer needed to carry a three-sippy-cup-diaper bag, but I still needed to carry a pull-up and some wipes. And I frequently need both hands. So, I figured that a backpack would work. And, of course, VB has a very cute backpack. This one is the Americana Red pattern (now retired) and I love it. wet wipes because I will ALWAYS carry wipes! Don't you hate that "gunk" in the bottom of the sippy cups or vase? I'm sure you've seen that "stuff" that refuses to wash out even after the cup's trip through the dishwasher. I bet you've even tried sticking your arm wayyyy down that skinny sippy cup or vase only to be unable to reach all of the gunk. Well... a little soapy water and raw rice to the rescue! Put raw rice and warm, soapy water into the cup or vase and swirl or shake. Throw out the soapy rice and rinse your cup or vase. Viola! 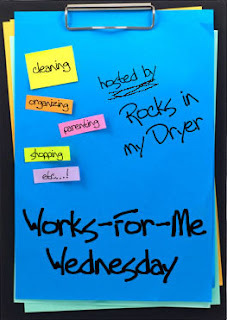 Look for other great WFMW tips over at Shannon's blog, Rocks in My Dryer. I've been thinking about starting a blog for quite some time. Actually, I've thought alot about blogging, but here's what's holding me up...What should I call it? I want something witty and cute and funny and...? "Silly Rabbit, Trix are for kids"
"Years of therapy- right there!" "Too bad God didn't pad that part of your body." Perhaps a store title for a blog title... I have a fantasy of owning my own little shop. (Mind you, this is truly a fantasy.) Years ago I wanted to own one of those stores that sells all sorts of neat, can't-find-it-everywhere stuff and I was going to name it, "The Bee's Knees." Then I had fantasy plans of opening a scrapbook store in a renovated old white church and naming it "Scrapbooker's Heaven." Lately, my fantasy store sells "all things boy" (don't get me started on all the lil' girl stores and nothing for the boys) and it is called, "Snips and Snails... from mudpies to dragonflies." Anyway, I just told you all of this store stuff to say, I think I will name my blog, "Mudpies to Dragonflies."